As some you know, I write from time to time for a fantastic site called Wandering Educators. In fact, I am their literary travels editor and just posted a story about California's Route 1. So, if you look to the right of this post, you will see a cool new badge on my site marking me as a Wandering Educators editor. Go ahead, click on it, see where it takes you. It will be some cool destination someplace on this earth. I recently got back from a hotel scouting trip (doubling as an exhausting family vacation) and wanted to report back that AcAmb has been enhanced with some smashing new offerings. Upon the recommendation of a member from Harvey Mudd College, I checked out (and into) the Hotel Roger Williams in NYC. Wow! From the moment we walked in, this place felt right. It's colorful without being startlingly and offputtingly chic. The rooms are so bright and cheerful (and not at all tiny a la Manhattan), the public spaces are very inviting, and the breakfast tremendously tasty!. Last stop was DC, where I needed to submerge my kids in the Palomar pool, cooling hot tempers while mom and dad chilled for (brief shining) moments. I hadn't been there before and have been showcasing the more intimate and trendy Topaz and Rouge on the site, but I loved the place and its location--so close to lively Dupont Circle. Hmmm...what else? Oh yeah, I worked out a deal with Enterprise/Budget Rent-a-Car. We now get an additional 5% off their already discounted rates. I know that's not blockbuster savings, but imagine if we all access that; it will mean (in the aggregate) tens of thousands more available for our worthy causes. Ever scouting for new hotels in yet covered cities, we're picking up a new haven in, uh, New Haven. It's boxy, glassy and classy, and it's called The Study. Continuing is my infinite search in London (suggestions, please!). Also, I'd like to add more to our Florida territory, especially as the warmth up here (New England) wanes. Lastly, and maybe most importantly to you, Kimpton has extended for us its 20% discount off their Best Available Rates until the end of March (we had been getting 10% off). So, from Seattle to Atlanta (new) and from Aspen to Chicago, we can drink their free wine (4-6 p.m.at most of their hotels) and luxuriate in their tiger-print robes (grrr), with the piece of mind knowing that our decadence is affordable. Enjoy! PS. Thanks, as ever, for passing word of AcAmb on--it's still very much a word-of-mouth endeavor! The editor who used my idea and sources without my consent has agreed to pay me a consulting fee -- reasonable and responsible conclusion. Here is the update on the story for those who are interested. I never heard a reply to my email from the editor and so invoiced him this morning for a consulting fee at my usual hourly rate for editorial work. In the end, I felt an hour fee was the most fair. He doesn't have a lot of money in his budget, and I am more concerned about protecting my colleagues than using this as a money making event. Thanks again for all the feedback and support. I don't want other writers to change how they interact with editors...unless this story gives them support if they they've been wronged. As writers, our ideas and time our our prime assets. I will keep you all updated as this story continues to unfold. After returning from a trip, I was talking on the phone with the editor of a magazine for which I occasionally write. We chatted about a number of ideas for his magazine, including one we both thought was interesting. I followed up with an email, to which he replied that the magazine was seriously considering the story idea we had discussed. He then asked me for more information. I emailed him and heard back this morning. His explanation was that another story fell through and he wrote the story quickly. He apologized and told me that since his magazine is a small niche market, I shouldn't have any trouble reselling the idea. 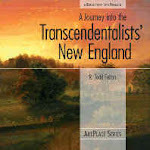 Okay - I'm jumping off into the world of multimedia by recording an audio tour of Transcendentalist Concord. I will be recording narration for the North Bridge, the Old Manse, Walden Pond, Bush House, the Concord Museum, the Wayside, the Orchard House, and Sleepy Hollow Cemetery. Each stop along the tour is about 5 minutes. I am doing it on my freshly-delivered iMac with Garageband. Is that the best option? What all do you use? Suggestions? Who has had success? Share your links to podcasts, mp3s and whatnot, and I'll check 'em out. I am becoming increasingly interested in audio tours that can be downloaded and brought with on an iPod, cell phone, or GPS unit. I remember one my dad had of the section of I80 from Auburn to Truckee in California. It was fantastic and we listed to it repeatedly. Here are some of the more recent ones I've found. Discovery Audio: they seem to offer a wide array of downloadable tours. I'm not sure about production values. 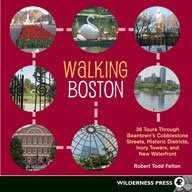 Audyssey Guides: I bought their CD on Boston to research my Walking Boston book and loved the high quality and interesting narration. Walk Talk Guides: these are mostly in Europe and provide an interesting business model. Visual Travel Tours: Multimedia tours for the iPod. Have you used any of these? Do you know of any others that are great? What about cell phone tours or tours specific to museums or other places of interest? What do you look for in an audio tour? Please jump into the conversation below. I know there are a number of readers interested in your thoughts on this one, and I'll be monitoring this closely all week. For those outside the book publishing world, Book Expo of America (BEA) is the annual gathering of book publishers, book sellers, librarians, authors, editors, and hangers-on. It’s where deals are struck, buzz is created, and the schmoozing oozes. As you can imagine, this year’s version was a bit subdued compared to previous years. As I wandered the rows of publisher booths at the show on Friday, I noticed a few things. First, I did not see very many new books. I had been hearing rumors of publishers shelving almost entire seasons of new releases until the economy gets better, but it really struck me here. In the past, many booths had stacks and stacks of pre-release books and galleys. This year, it was easy to navigate my way through the crowds without bumping into books. Secondly, and I fully applaud this move, there were three stages right on the expo floor, where authors and influencers gave interviews, talks, and presentations. Much of this was about how to use Twitter and social networks to promote content. Not necessarily books, but content. This brings me to my final observation. It seemed to me that everyone at the show was waiting to exhale – waiting to see what comes next. I firmly believe that there will be a need for good content: wonderful stories, engaging nonfiction, thrilling poetry. And I think everyone recognizes that the book as we know it is quickly evolving to other, more electronic forms. The big question is what this will do to our reading and writing styles? I look to the music industry where the notion of an album is evolving in the face of iTunes. Audiences are getting used to only paying for the content they want. What do you see happening? What are you willing to pay for? A writer and photographer, Robert Todd Felton has written about Thoreau's Walden Pond, Yeats' Ireland, and Emerson's Boston. He has also penned articles on hiking in the footsteps of Jack Kerouac, exploring Hunter S. Thompson's Las Vegas, and driving through Austria where the hills are alive with The Sound of Music. 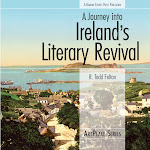 His books include A Journey into the Transcendentalists' New England and A Journey into Ireland's Literary Revival (both from Roaring Forties Press), as well as Walking Boston from Wilderness Press. His shorter work has been published in National Geographic Traveler, Backpacker, The Gemutlichkeit Newsletter, Draft, and Automotive Traveler. His photographs have appeared in books, journals and in exhibitions across New England.